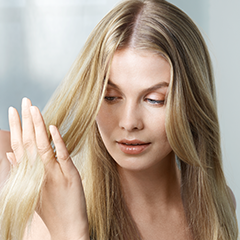 Start hair regrowth today by using ROGAINE® as soon as you notice thinning hair. ROGAINE® hair regrowth products are designed to fit easily into your daily routine, and are safe to use every day—even on color treated hair. Like many good things, it takes patience to achieve the hair regrowth benefits of ROGAINE®, but the reward of thicker, fuller hair is totally worth it. Your hair loss didn't happen overnight, right? The same is true when regrowing your hair. ROGAINE® products with minoxidil start to work immediately to make way for new hair by reviving hair follicles, increasing their size and lengthening the growth phase. With daily use it may take at least 4 months to begin seeing results. Then stick with it—it's essential to keep using ROGAINE® every day to maximize hair restoration and help maintain hair regrowth. Here's what to expect during the first few months when you apply ROGAINE® daily. At first you may notice a temporary increase in shedding…but don't panic—this is a good sign! ROGAINE® is clearing out older, thinner hair you would have lost to make way for new, thicker and healthy-looking hair to grow. Soon you may see soft, colorless "peach fuzz" begin to grow. As you continue using ROGAINE® daily, new hair the same color and thickness as your other hair will grow in. When used every day, ROGAINE® will continue to revive follicles, helping you grow thicker, fuller hair. For maximum, lasting results, remember to make ROGAINE® part of your daily routine. If you don't see results after 4 months of applying ROGAINE® to your scalp daily as directed, talk to your doctor or call a nurse at 1-800-764-2463.